RISE Moldova reporters infiltrated an organized network that has a monopoly on fruit exports to Russia and obtained two sets of documents signed by Chișinău plant health specialists and customs officers. The documents permit the export of two fruit trucks to the Russian market, bypassing the Russian embargo. The members of the group demanded US$ 10,000 from the undercover reporters, which was to be transferred to an account in Russia before the goods reached Russian customs. Ciobanu says exporters are upset because two companies located within Moldova proper have been classified as Transnistrian, while not being required to provide information about the actual origin of the products or how they will be transported. Viorel MINCIUNĂ, President of the Association of Importers and Exporters: Since the end of July they have been attempting to limit our right to export and to refuse issuing us certificates based on some invented reason, while two “Transnistrian” companies that are backed by Chișinău-based businesspeople continue exporting fruit from the entire territory of Moldova. RISE Moldova has obtained an audio recording made on July 30, 2015 of a group of exporters planning a scheme to monopolize fruit exports. They list names of companies, exporters, plant health inspectors, prosecutors and politicians they claimed to be “their people.” In the background, one can hear the live broadcast of a speech being delivered in the Parliament by Valeriu Streleț, the candidate for prime minister. According to some fruit producers and exporters, that was the point at which the Moldovan plant health inspectors stopped preparing export documents even for some companies registered in Transnistria, referring to a verbal order of the NFSA management. One Moldovan company was transformed overnight into a Transnistrian company, which instantly made it eligible for the entire package of papers necessary for exporting to Russia, regardless of the region of origin or quality of the produce. Monday, 3 August. A RISE Moldova undercover journalist contacts Diaconu, founder of DVT Broker SRL. The reporter introduces himself as a businessman who has purchased 19 tons of apples and 19 tons of plums from various individuals from the district of Cantemir, which is on the western edge of Moldova, across the country from Transnistria. Reporter: We would like to export to Russia. We need labels and export documents. Diaconu: When and where do we load? What apple and plum varieties do you have? Reporter: “Melba” and “Kabardinka”. How much will the preparation of the set of documents cost? Diaconu: Five – the apple, and four and five hundred – the plum”, or US$ 5,000 for the apple truck and US$ 4,500 for a truck of plums. Wednesday, 5 August. The first meeting takes place near the Bogdan Voievod market in the district of Râșcani. 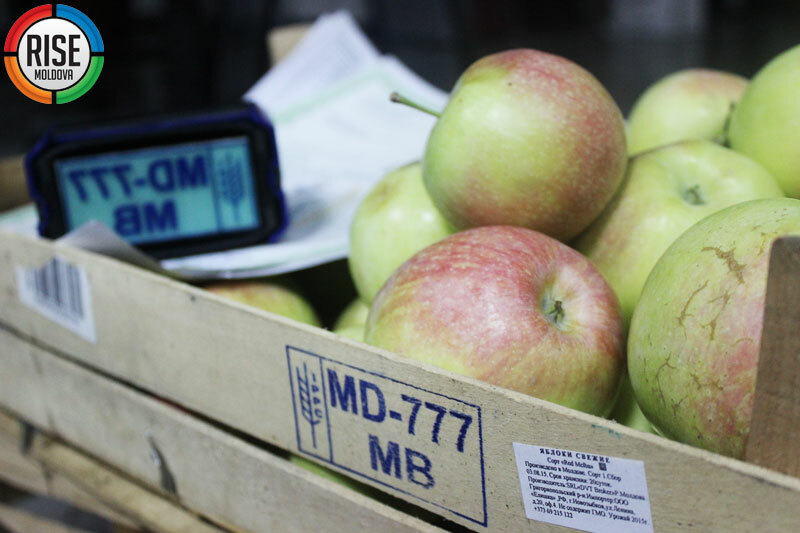 Diaconu provides labels to be attached to the fruit cases: 1,400 self-stickers for the apple cases and 1,900 for the plum cases, enough to fill two trucks. Later, RISE tells Diaconu that another problem has arisen – the lack of documents of origin for the fruit, which is mandatory for exports. Nonetheless, Diaconu says he will export the goods to Russia without them. He says he will need a copy of someone’s identity card, regardless of their domicile, to appear in documents as the seller. He says RISE should write on the copy that the person had sold 19 tons of apples and of plums. “If the tax people call you, confirm to them that you have sold me the fruit,” Diaconu suggests. Later that same day, RISE reporters received from Diaconu two sets of official documents that permitted export to Russia of about 38 tons of fruit, without lab analyses or goods inspection. The documents said that the goods were not coming from Cantemir but from the Transnistrian village of Mălăiești, district of Grigoriopol, the current legal address of DVT Broker SRL. On delivering the export documents, Diaconu said the fee would be US$ 100 more than he had quoted, as he had forgotten about a bank fee. RISE promised to transfer the US$ 9,700 (US$ 5,100 for the apple truck and US$ 4,600 for the plum truck) to the Russian bank account he had indicated. Saturday, 8 August. Noting that the money had not entered the account yet, Diaconu called by phone to say, “The trucks have not left Moldova yet! !” He asked for the phone numbers of the drivers. RISE assured the money would be sent and tried to renegotiate the fee owed to him, suggesting it was too high. “I don’t care who tells you what. I told you this amount before you took the papers. If the money doesn’t come, the trucks will stall at the (customs) terminal. Each day of stalling will cost you an additional US$ 50,” Diaconu warned. By coincidence, on the day reporters were to meet with Moldova’s main plant health inspector Alexandru Ciobanu for an interview, Diaconu spotted them as he was leaving his office. Realizing they were journalists, he asked for the return of the documents and the stamp. “Let’s work something out…,” he said. Ciobanu, in his turn, denied knowing Diaconu. “He is a business operator,” Ciobanu said evasively. But subsequently he recalled that Diaconu was the founder of DVT Broker SRL. The plant health documents received from Diaconu are signed by Boris Cojocari, the main inspector at the NFSA’s territorial subdivision in Criuleni. Reporters asked Cojocari to explain the rules for the preparation of export documents, introducing themselves as producers from Moldova. “You must bring the journal of the chemical treatment of apples and one kilogram of apples to our laboratory and to the one located in Chișinău for tests for quality and quarantine compliance. In principle, I must also come to the orchard to convince myself that you take the produce from there. As a rule, the testing of fruit in the laboratories lasts one day if it’s urgent or 48 hours. 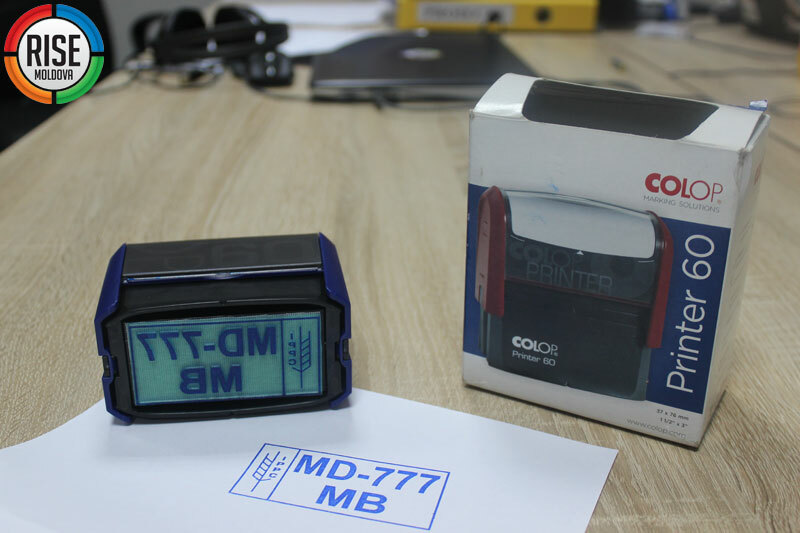 Without a lab expertise, no one will issue you documents for export, especially to Russia,” Cojocari explains. After the first discussion, reporters contacted Cojocari again but this time introduced themselves as acquaintances of Diaconu. Undercover reporter: I’m calling you at Vasile Diaconu’s recommendation. I have plums in the district of Cantemir and I don’t have time for tests. Help me get the necessary documents prepared. Criuleni inspector: I cannot prepare anything for you before I check if your company is not a phantom. 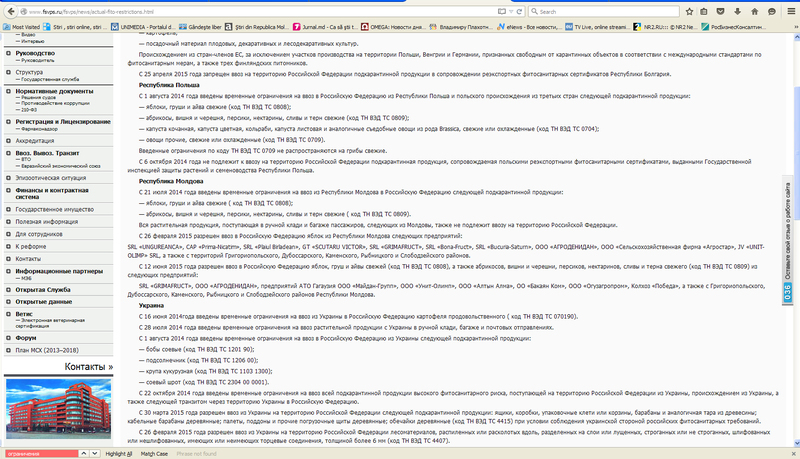 We have all been communicated the list of Transnistrian companies. Go and speak with him because he has the right to export from Transnistria to Russia. The third time reporters contacted Cojocari, they identified themselves as journalists and asked if he could issue plant health certificates for fruit produced in Cantemir. “No, this is inadmissible,” Cojocari said. Viorel MINCIUNĂ, Head of the Association of Importers and Exporters: “The territory on the left bank is our little Moldovan window for the export to Russia, which perfectly knew about it but was closing their eyes because the Russians didn’t intend to block completely the export from Moldova. Iurie BIVOL, farmer, explains the system: The exporter appeals to the plant health inspector who refuses to issue him a certificate. The [local] plant health inspectors are harassed – they have been ordered to act according to the directions from Chișinău. After the exporter leaves the inspector’s office, the information about “the client” is transmitted to the central office of the NFSA. An intermediary contacts the company’s representative, offering help with the export of the produce via some trustworthy companies from the list. Even having Transnistrian residence does not save the company, because it is not in the list of those who are close to the head of plant health inspectors, Alexandru Ciobanu. Indirectly, Ciobanu himself contributed to Russia’s imposition of an embargo. On Sept. 10, 2013, Alexei Saurin, the head of the Rosselhoznadzor drew the attention of the Ministry of Agriculture to the fact that Moscow had declared Moldova as a country with “high sanitary risk”. This happened after hazardous pests had been discovered in a batch of plums exported to Russia by the company Bioplanprotect SRL. In 2013, the customs officers and plant health inspectors required that fruit exporters spend US$ 150 for a “clipper” – a term used for the certificate stating produce was harmless, issued by the Association of Producers and Exporters of Vegetal Produce “MoldRusProdExpo,” headed by businessman Leonid Coca. One year later, Coca was apprehended by the National Anticorruption Center on suspicion of money laundering, passive corruption, and influence peddling (Details, HERE). After several months in custody, Coca was placed on home arrest and, without waiting for the sentence, fled the country. Eduard Harunjen, First Deputy Prosecutor General, told RISE Moldova that Coca was hiding from the country’s law enforcement and is being sought internationally.